It is Diwali, the most important festival of the Hindu calendar, in Delhi. A hundred-thousand fireworks turn the city’s rooftops hues of blue and orange, their concussive explosions sounding like a military barrage. As Bunker Roy greets me he points to the sky and says “that, my friend, is the sound of money being wasted”. As the founder of the Barefoot College, this will rank high on his list of sins. The College, which brings people from all over the developing world to a small village in Rajastan to teach them how to be solar engineers, has brought Roy worldwide attention, with Time magazine naming him one of its ‘100 most influential people’ in 2010, and his recent TED talk attracting over 4 million views. A steel-haired man in his sixties, he still carries the Brahmanic authority and grace of manners of his origins. A few minutes in his company though, it is easy to discern the energetic and playfully non-conformist young man who struck on the idea that shaped his life. Born into a well-to-do family near Kolkata he followed the familiar arc of the scions of the Indian elite, first attending the famous ‘Doon School’ in the foothills of the Himalayas, “more elitist than Eton and Harrow”, he remarks, and then on to university. A career in the professions or the civil service beckoned, but on completing his degree in 1965 he travelled to work as a volunteer digging wells in the state of Bihar which had been struck by famine. The engineer he worked with invited him to visit his home village of Tilonia in the Rajastani desert. While there Roy hit on the idea of founding a University for, and run by, the poor. “I went to visit Tilonia and stayed for forty years” he smiles. As we sit down to chapatis and thali, it doesn’t take any prompting for him to begin on a bullish polemic. “There are huge gaps in the existing aid model. Before, people identified their own problems and simple cost-effective solutions, but the aid industry as it is is a juggernaut out of control and poverty is big business…lots of people’s jobs are at stake. Why do we need someone from Oxford or Stanford to tell us how to tackle poverty? They spend one week in a village and think they understand the problems…ridiculous”. Almost unnoticed in the midsts of the Western World’s Great Recesssion, much of the developing world has been going through an economic quickening. Growth in Sub-Saharan Africa has held steady at around 6% in the last four years. The vast potential energy of its young population is slowly being unleashed. The high price of commodities, and a period of relative political stability in the region has helped, but it as much a bottom-up as a top-down phenomenon. Innovative banking systems coming from Nairobi are allowing even the most isolated rural farmers to gain credit, send money and do business. But with less then eight per cent of people connected to an electrical grid, the capacity for growth is limited. On a recent trip to Malawi, I visited the previously powerless rural village of Kaphuka to which two students from Roy’s college had returned. Around the straw roofed hut they used to assemble their solar panels, little cottage industries had sprung up: a barber’s with a battered electric shaver, a mobile-phone charging point, even a small cinema. The skills they had brought back were grounding an economic dynamo. The economic growth that the region is undergoing is what the World Bank has spent decades, and billions of dollars, trying, and largely failing, to create. Through the centre of Kaphuka ran huge electricity pylons, the result of a World Bank and Malawian government initiative. That the villagers had no access to the electricity that thrummed through them seemed an apt symbol of the disconnect between the western Aid industry’s wishes, and the needs of the people they are trying to help. Leaving Delhi to visit the College the next day, we travel the old trunk road to Jaipur. It seems the whole of India is on the move, turning the road into an eight-hour traffic jam of wobbling three-to-a seat-motorbikes and wildly-coloured trucks covered in images of blue multi-limbed gods. Beyond Jaipur the road becomes quieter and the green brown plains of the Rajastani desert stretch out towards a bulbous purple sun. This is an area of subsistence farming and seasonal rhythm, ever teetering on the cusp of grinding poverty. As we turn into a rough track that leads us to Tilonia, we see people working the fields, women carrying bags of grain back to the village and cattle wandering louchely by. It is a scene that could come from nearly any developing country and Tilonia, a dust-dry, low-walled collection of houses, could be any village. But in Tilonia, the problems of poor rural communities have been largely solved: every house has a solar panel on its roof, a solar-powered pump gives a constant supply of water, a beehive hut houses a small telephone exchange and in one small room I find a College administrator busy working on a solar-powered laptop. Though what is most remarkable about the village is that it is otherwise so unremarkable. There are no signs telling you that this is the Barefoot College, no branding, no fresh faced western volunteers walking around in ‘Barefoot College’ t-shirts, none of the bureaucracy and aggressive marketing that one sees when visiting western NGO-funded projects. Tilonia remains an ordinary village, it just happens to be where something extraordinary is happening. We are led to a warehouse with peeling walls. Inside are forty women, their faces a patchwork map of the developing world – El Salvador, Vanuatu, Ethiopia. They sit in front of a tangle of wires and circuit boards, the blue flames of small soldering irons lighting up their features as they assemble solar panels from scratch. Most of these women are grandmothers who had rarely, if ever, left their home villages. I ask Maria from El Salvador if she was worried about coming to India. “Yes”, she laughs, “I thought I was going to be eaten by lions”. Roy favours grandmothers as students as they are the most likely to return to their villages with their new skills rather then moving to a city to profit from them. 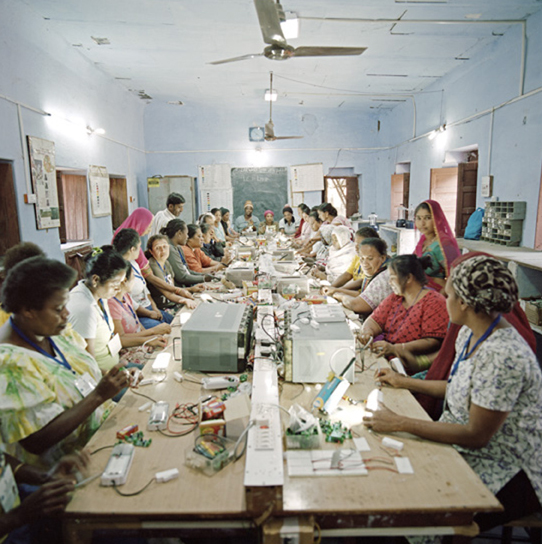 As the women are mostly illiterate, the Barefoot College uses a unique colour-coded wordless system to teach solar engineering. At the head of the long table where they sit stands another Indian grandmother, a graduate of the college, leading them through their lesson. After six months these women return to their villages. As the knowledge they have gained has been simplified and given orally it is easily passed on. As Roy says “every student becomes a walking, talking Barefoot College”. He gives the example of two grandmothers from Afghanistan who spent time at the college, They returned home, taught another twenty-seven grandmothers who in turn electrified 100 villages. I finish by asking Roy what he would do if tomorrow he became head of the World Bank. “I would put all the staff on minimum wage. I would have them live for six months of the year in a village with no electricity or running water so they understand poverty. I would do that with the UN too, but, as it stands, there is a vested interest in keeping people poor”.